I'm a computer forensics attorney, which partially explains my focus on gadgets and tech. When I'm not traveling to client sites, I work from home. And since we moved last summer, I've had the opportunity to put together a pretty solid home office. It became apparent really, really quickly that I needed a printer/scanner that had a document feeder - essentially every day, I'm printing-signing-scanning some sort of document. I currently have a Canon PIXMA MX410. It's a very good all-in-one printer. It has a document feeder, it works wirelessly with my work PC and my iMac, and it's pretty easy on the ink. I have absolutely no complaints. Actually, I have one complaint. The MX410 is not AirPrint capable. So I can't print directly from an iPad or iPhone. This seems like a pretty weak complaint - and it is, really. I haven't had the need to print from an iPad - at least, I don't think I have. But it's an iOS function! One that I haven't used! Who is to say that I wouldn't print from my iPad all the time if I only had the option? So, basically, I think I need to upgrade to an AirPrint-enabled All-In-One. With a document feeder. There's no way I'm going back to flatbed scanning one page at a time. Which leaves me with the Canon MX series. Let's check the specs: 4800 x 1200 dpi, 2 ink cartridges (black and color). An old digital watch-style text-only LCD. More or less, exactly what I currently have - but with AirPrint. And I'm happy with what I have, so this is definitely an option. 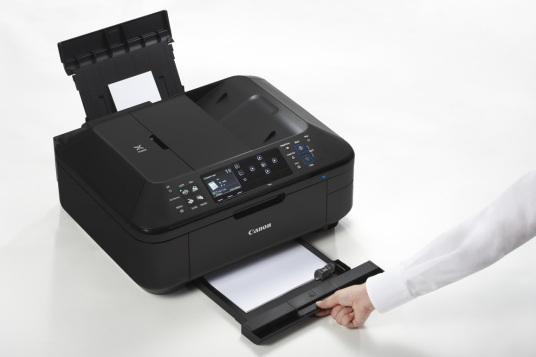 Canon makes more expensive printer/scanners, too. And I assume that they have more, or better, functionality - but are they worth the extra money? What does the extra money get me? Well, it's still 4800 x 1200 dpi, so I suppose we're gaining the 2.5 inch color LCD screen on the front. Granted, that's a nice feature - but it's a bit silly that they claim anyone would edit a photo on that 2.5 inch screen on their printer. That's what Lightroom, Photoshop, or even iPhoto are for. We also gain a port for USB devices and memory cards - but again, I'd rather control the "what I'm printing" side of things from the iMac. A slide-out paper cassette! In a home office that needs to stay nice-looking, this is kind of a big deal. You don't realize how much you miss paper cassettes until you spend 6 months looking at 50 blank sheets of paper sticking out of the top of your printer. So, the MX892 offers 2 interesting things that my current MX410 doesn't - a paper cassette, and AirPrint. That's nice, but is it worth $60 more than the MX432.... or $150 more than sticking with my trusty MX410? Honestly, if I'm a buyer, I'm probably going to go with the MX892 - JUST for the paper cassette. Just finding your blog, so this is an old post. You didn't follow up with what you ultimately decided to do for a printer. So, FWIW - I use a very inexpensive application call HandyPrint which lets me print from my iOS devices as long as my computer is on. Much cheaper than a new printer and works quite well. - I have the MX870 which has all the features of the MX892 minus the AirPrint. I bought it a couple of years before that capability existed. Hi! Ultimately, we went with an HP Envy 4500, because we wanted a smaller form factor, that would fit into a Pottery Barn Bedford cabinet. The AirPrint functionality has already been a big help - I had to print a document from my work iPhone, and I didn't want to email to gmail, and print from my computer. With AirPrint, the iPhone sees the printer, and that's that. There's a post on the front page about the new printer, titled "Is HP Instant Ink a Good Deal" or some such.